I am giving away a copy of Planet Amazon the Rebirth by Crystal Dawn on Goodreads.com. The giveaway runs until March 25th. Don’t forget to enter and good luck! In the Danfians Prophecy: Chloe Rose discovers that not only is she a human but also a Danfian and a Sofayan…spirits from another planet. She must leave everything she knows as her life is in danger. Chloe is being pursued as she is the one prophesied to destroy Ivan, the leader of Sofayans who control this world. Chloe is captured by Alexander, a Sofayan who is a bounty hunter. She ignites a passion within his heart, that lay dormant for centuries. And Chloe feels as if she has been cast under his spell. Will they stay loyal to their cause or will they give in to their hearts? Author bio: After graduating in law from the University of East London, I embarked upon a very successful career within the Media/advertising industry. 10 years of experience accumulated in becoming an Account director at Future Media Exchange Ltd. However things need to move on and progress in life, so my husband and I decided on having children and never did we expect beautiful twin daughters. Whilst on maternity leave, Future Media Exchange liquidated, leaving me at a rather loose end in terms of a flexible career. I started to imagine the first scene of the book and after much encouragement from my husband, I decided to put pen to paper and wrote The Danfians Prophecy. The Danfians prophecy is Sci-fi/Fantasy Novel. I’ve throughly enjoyed creating this story and hope that the readers will enjoy it too. Hello, Lubna, I’m so glad you could join us. Hi Crystal, I’m glad to be here. We’ll just jump right in and asked some questions. Q. What draws you to scifi? A. The mystery element about whether other beings exist. It’s the unknown that attracts me. Q. Do you find it difficult to keep up with all the background when you are dealing with several races? A. Not at all, it was strange actually, once I decided on two different species everything just kind of fell into place. I knew what strengths Sofayans were to have and the Danfians also. It is mixing these strengths with human vulnerability that made it interesting for me to write. Q. Do you find that you ever have to turn of the writer and just be a mom and a wife sometimes because your family feels left out or have you found a way to balance that? A. I am actually quite lucky to have found a balance. I have a supportive husband who understands my need to write and helps take care of the twins at times. I really enjoy being around my twins, so I find it easy enough to switch the writer head off. The writing works around my family, not the other way and that works fine for me. Q. Do you find twins are harder to raise(two times the work) or easier(they play well together)? A. Being a first time mum with twins, I wouldn’t know whether it is harder or easier (LOL). It certainly has it’s challenges, but the rewards are twice as good. They are at a wonderful age of 4 years and they often play together and love each other’s company. In nursery you will find them together, even though they are in separate learning groups. Q.. Do you miss having a more traditional job sometimes? A. There are times where I miss my individuality, before I became a mum. I was made redundant whilst on maternity leave, since the company I worked for liquidated and it was difficult to find flexible work within an advertising agency, with my skill set (Account Director). So to still keep myself as ME I became a writer. I don’t miss the traditional work place anymore, I enjoy what I do. I get to be with my family and i’m quite lucky that I can. Q.. Any suggestions to new authors on managing all the different aspects of writing, marketing, and publicity? A. I’m still quite new at this, but I would say, do the research thoroughly. My focus is to find where my target audience’s are, what websites they visit, see if I can perhaps have a feature on those sites. Asking for reviews is helpful and gives the author credibility. Q. If you had to pick just one person that most influenced your writing, doesn’t have to be a writer, who would it be? A. There isn’t one person in particular, my greatest influence would have to be fantasy epic adventure movies, but for me they always lacked romance. I always felt like there should have been more romance to all of these movies, hence why I wrote The Danfians Propehcy. Q. Is there anything you want your fans to know that I haven’t asked you? Anrea Stanton goes from the lost city of Atlantis to the legendary world of Amazon. What will she find there? No one knows. Albert A. Correia is a native Californian, having grown up in Tracy, located in that state’s vast and agriculturally rich Central Valley. He had a rewarding career as a Chamber of Commerce executive in the U.S. before moving to Costa Rica. While attending the California State University at Fresno, he interned at the Fresno, Oakland and San Leandro Chambers of Commerce. He received his Bachelor of Arts degree in Journalism from Fresno State and was a reporter for a newspaper in Fresno while attending college. Following graduation, he served as assistant manager of the Berkeley Chamber of Commerce. He then went on to serve as chief executive officer of the San Fernando, Pasadena, Pomona, and the Mid San Fernando Valley Chamber of Commerce, all in California. Among other honors he received in the field, he was presented the Russell E. Pettit, “Executive of the Year Award,” by the California Association of Chamber of Commerce Executives in 1986. Since arriving in Costa Rica in 1995, Mr. Correia has devoted his time to the arts. In addition to his writing, he paints, and a number of his oils hang in prominent buildings in and around San Jose, Costa Rica’s capital city. He is a devotee of Costa Rica’s renowned symphony orchestra. He lives in a quiet suburb of the capital with his wife, daughter, two stepdaughters, and one of his wife’s nieces. Two of his sons live in California and the third lives in Las Vegas. When not in San Jose, he spends time in Jaco Beach where he lived a number of years before moving to San Jose. Q; Bear with me this is my first interview. I’m a little nervous interviewing a former reporter. What inspired you to write Even in Eden? It started as a single book, EVEN IN EDEN. After living in Costa Rica for several years, it became obvious that the people, although a bit more tranquil that most, have the same dreams, aspirations and weaknesses as people everywhere. I had a couple of doctor friends and I’ve dealt with people in most fields, including charitable works, so an idea was born. Toss in the fact that there are really dedicated people trying to do good, and others who are adept at making people think they’re trying to do good while they’re ripping them off, and the story flowed. The flow continued with the sequels, EDEN: HEALTH, POLITICS, RAGE and A PRESIDENT FOR EDEN. They make up The Eden Trilogy. 2. Q: What in your past best prepared you for the difficulties you face as a writer? My degree was in journalism and the jobs I had in my early years as a chamber of commerce executive required my writing news releases and monthly newsletters. True, that kind of writing involves the recording of facts and novels are a test of the imagination, but in many ways, writing is writing. Although, like all writers, I get “writers block” from time to time, writing is too enjoyable to be called difficult. On the other hand, once the writing is done, the difficulty begins. Finding ways to get books out for public consumption is not an easy task. It’s not often that a good writer is also a good marketer. Fortunately, or unfortunately, depending on your point of view, I’ve run into difficult situations before, so I’ve learned to be patient. It often takes time, but I get there. 3. Q: Do you find past life experience helps you when you give your characters life? Absolutely. I’ve met, worked with, befriended and watched some of the best people in the world, some of the worst, some who are quiet, some who are loud, some as sane as can be, some just plain nuts. I’ve worked in dynamic situations, sailed in dangerous ones, and tramped through countries in hostile environments. In so doing, I’ve run across some of the most intriguing personalities imaginable. Those personalities find their way into everything I write. Sometimes I pick and choose characteristics from different people, but there’s no need to make up those characteristics when the world is so full of colorful people. 4. Q: How much research did you have to do for your trilogy? That depends on your definition of research. Research can be reading through a knee-deep stack of thick, dusty tomes in the dead of night, or it can be personal research – doing things yourself. I needed to do some reading of the Costa Rica constitution, and asked some questions of people, such as newspaper editors, but much of what is in my books represents things I, and others I know, have done. 5. Q: How does your wife handle all the demands on your time? She has her own busy schedule taking care of the kids and so forth. She also represents some cosmetic companies. Family is very important in Costa Rica and she’s from a large family, so there’s always something to keep her occupied. 6. Q: Is there anything special you do that helps you with your writing? 7. Q: Your doing great. That’s a good tip. Maybe I need to listen to some classical music. What is the one person or event that most encouraged you to write. There are many, but I’ll go back to my last year of high school and Bill Milhizer, an English teacher. At the time, I had no idea what my future held, or that I even had one. Bill thought I put words together fairly well for a farm boy who never bothered to study. We became good friends and I went on to do something I had no idea I’d ever do when I was seventeen – I went to college. 8. Q: What is your favorite genre to read and to write? I like to read thrillers and humor. I like to write thrillers and humor. 9. Q:How much does the place you live feature in your writing? 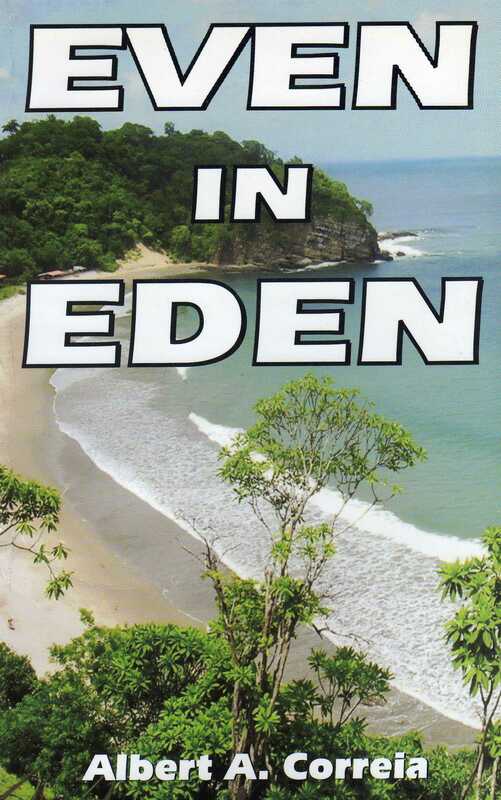 The Eden Trilogy takes place in Costa Rica, where I’ve lived for the past eighteen years. It’s a small version of the United States (a little over four million people), but more tranquil. 10. Q: Is there anything you would like readers to take from your books? One theme that runs through The Eden Trilogy is that people should look for what really is there, not what they’re told is there, or that they want to be there. And, of course, that life is really pretty humorous. Laughter, or even a little chuckle, beats a sour puss every time. It is my intention to start doing interviews of authors. There are many good authors out there who not only write exciting books, but they are interesting, funny, warm and sometimes quirky people well worth knowing as individuals. Andrea Staton, an Army Colonel, dedicates her career and her life, to finding the hidden doorway from Earth to the planet Amazon. She is expecting an advanced world that she can learn from, but she is surprised by what appears to be a primitive world that is at war with Gallegos, the closest planet to them. As she negotiates her way around Amazon, Gallegos, and further into their galaxy, she learns secrets that unlock the past not only of these worlds, but also of Earth and specifically her own ancestors. She must learn to be a warrior and to deal with the men here who she finds very different and much harder to resist than the men from Earth. Can she choose between the men that pursue her or will she choose to pursue the elusive man that resists the attraction they share? During her journey, she finds that not only can one person lead to great change, but also that sometimes you can’t fight fate.